Funny old game, surfing. It is fundamentally rooted in the vagaries of the elements but has been re-imaged by generation upon generation of surf-stoked kids — from San Clemente to Shibuya. The explosion of surfing this past decade has seen the aesthetic fragment as never before. There are these days as many meanings and manifestation of surf culture as there are surfers themselves. Shinya Hasegawa’s Batten Sportswear range of elementally inclined schmutter reflects this kaleidoscopic beach dwelling heritage. As the northern hemisphere swivelled deeply into winter we caught up with the Japanese surfer and long time Brooklyn resident who learned his craft alongside the great Daiki Suzuki. Batten Sportswear Travel Shell Parka modelled by Mimi. Michael Fordham: How did you come to work with Daiki Suzuki, and how was he influential in your creation of Batten Sportswear? Shinya Hasegawa: After I finished at the Fashion Institute of Technology, I started working for a vintage clothing company in New York. At that time, a mutual friend introduced Daiki and me. Of course, I already knew about Daiki and admired his work greatly. It turned out that he had been looking for someone who knew a lot about vintage clothes to be his design assistant for the Woolrich Woolen Mills project of WP. I started working with him in 2007. Daiki has been really influential to me in my own work and was a huge supporter when I decided to make my own brand. He has immense, contagious passion for well-made garments—the history behind any one design, the need for ingenuity in technical detail and structure, and the opportunities that clothes give us for expressing ourselves. I learned a lot from him about how to focus on the details in any design and how to craft clothes that are true to vintage inspiration as well as suited to contemporary aesthetics. I was working for WP for 4 years, so it was like college—like majoring in “how to make clothing” with Professor Daiki. 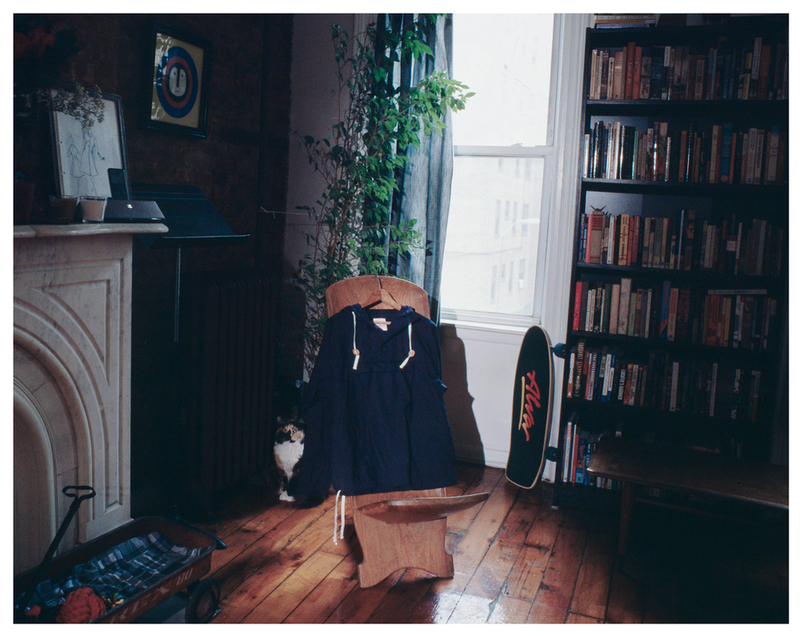 Mimi, Batten Sportswear Packable Anorak, Alva skateboard... did we mention Shinya has Woolrich Woolen Mills issue chambray curtains? From which brands and which periods of the history of surf culture have you drawn particular inspiration? I’m really interested in the turning point in surf culture and casual fashion that happened in the late 1960s through the 1970s. This was a time when surfers started using shorter boards—in fact, in the span of ten or so years, the shape of surfboards changed dramatically. At the same general time, of course there were the anti Vietnam protests and gatherings like Woodstock. There was such good energy in the culture of that time—everything was challenged and everything was changing. I think that energy revolutionised the way that people made and wore clothing. For example, when you study about the details of outdoor or surf or work wear from before the 1960s, you can see that they focus on utility. And, of course, utility is most important for these types of clothes. But in the 1970s you also see innovations in design that go beyond utility toward fashion. During this time, they started experimenting on how to make clothing for an evolving and expanding consumer market. There were so many great ideas—great successes and spectacular failures. I find this period in surf and outdoor fashion to be really fascinating. I have lots of favorite old brands in surfing and outdoor clothing, but I especially get inspiration from old Levi’s, especially orange tab items, and outdoor clothing companies like Holubar and Gerry and early Patagonia. What sort of clothing do you think contemporary surfers need, and how do Batten's pieces reflect these needs? I make Batten Sportswear for people who enjoy the outdoors, whether they find themselves at the beach or in the mountains or hanging out in the city. These are people who appreciate well-made clothing that can handle the demands of outdoor activities and are still fashionable for everyday wear. I think that surfing (and other outdoor pursuits) breeds people who are dedicated to their sport in a way that defines them in their day-to-day life. They want clothing that speaks to that dedication. How important is it that the person with the vision behind Batten is the person responsible for its design, production and development? When starting this brand, I wanted to create a company infrastructure that was simple and honest and true to my vision for the clothes. I thought it was important, at least in the beginning, that I be involved completely and intimately in every aspect of the company, from design to marketing and sales to production and shipping. I wanted to get to know my suppliers and customers directly. I just thought I should experience everything. When I have a chance to hire team members in the future, I know I will be able to teach them from example. There’s been a huge rise in interest in heritage and authenticity in the world of menswear these last few years. Where does Batten fit in with this aesthetic? I think there’s always a certain nostalgia for the eras of music, fashion, art, graphic design, and literature that lead us to where we are today. With menswear, I feel like most guys—at least my friends and I—are searching for a historic niche or period in clothes that excites us in a genuine way. There are so many options out there that it can be overwhelming, so when you find something that speaks to a time and an aesthetic that feels familiar, then it’s almost a relief, like coming home. Getting there is all about the hunt and the gathering of knowledge and information. Batten Sportswear is a manifestation of my own personal hunt, if you like. Some would say that surf culture is deeply rooted in the explosion of rock n roll and hot rodding in mid century USA . As a surfer from an emerging surf nation like Japan, how have your experiences fed into the clothes that you have designed? I don’t actually believe that surfing is originally rooted in rock and roll. I think that’s just the way that surfing has been marketed over the years, through movies, etc. I think surfers come from all different walks of life and that early surfers surfed for the same reason we surf now: because it feels like the right thing to do. People have been surfing in Japan for virtually as long as they have anywhere else. I don’t feel like there’s a huge difference in how I’ve experienced surfing itself in Japan or in New York or in California. Of course, the surfing culture is different in each of these places, and the conditions for surfing are different too (the types of waves and breaks, etc). But in the end, surfing is surfing. The way that the culture setting in each region affects surfers and their style is interesting to me. 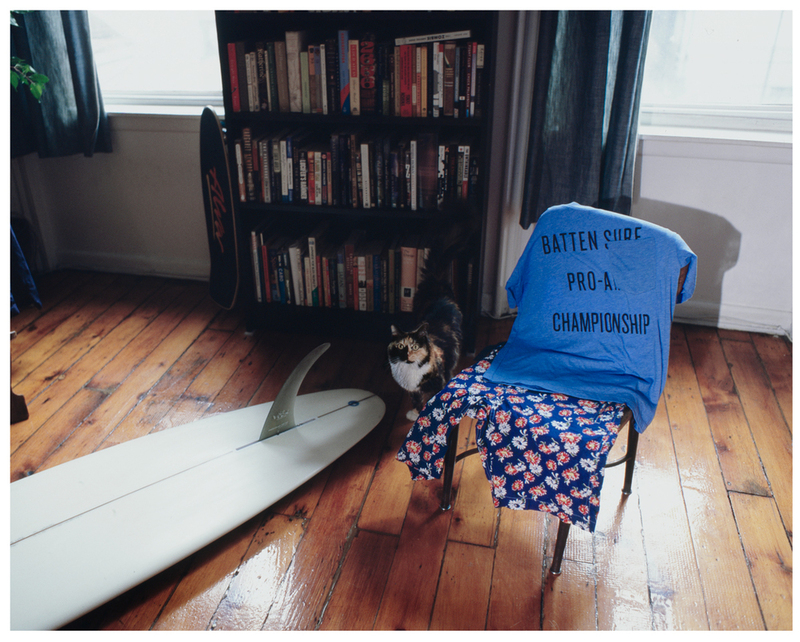 With Batten Sportswear, at least in part, I’m looking at how American east coast culture interfaces with surfing. I understand that if you come from a place like Southern California or Hawaii or parts of Australia, where surfing is part of the mainstream culture, it may seem weird that there are these pockets of surfers in places like Long Beach, NY where for most of the year, we need to wear really thick suits and hoods and gloves. It may cause people to question our motives or even our sanity. But I think surfers surf because they need to. They’ve experienced the lifestyle and it becomes part of them. So, even if you have to wake up at 5:00, drive an hour to the beach, squeeze yourself into high tech gear, and dive into freezing waters, you do. Because you’re a surfer. I’m still in the lifelong pursuit of figuring out what this is and will be all about—that’s one of the unique things that Batten Sportswear brings to the fashion game.